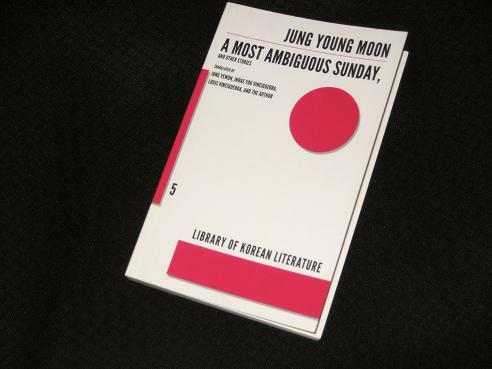 A Most Ambiguous Sunday (review copy courtesy of the publisher) is a collection of fourteen lengthy stories by Korean writer Jung Young Moon, running in total to just under 300 pages. The back cover claims that the writer is “considered an eccentric in the traditional Korean literary world”, and having read this collection, I can only agree. Readers who enjoy simple stories with important things like plots and characters should probably move along – nothing for you to see here , I’m afraid. Those who are a little more prepared to trust the writer, though, ready to take a leap of faith in the hope that all will gradually come clear, will find a lot to enjoy in Jung’s idiosyncratic tales. The beauty of the stories is less in what they say and more in how they’re constructed and in the mood the writer conjures up. At times, he overreaches himself, and you might find yourself glazing over and wondering where the last five minutes went, but on the whole, the stories have a hypnotic pull, drawing the reader effortlessly through to the final page. Many of the stories are notable for the feeling of calm they extend, even when the protagonists should be anything but. In ‘Mrs. Brown’, one of the better-known stories, a brutal home invasion turns into a polite afternoon tea party as the hostess absent-mindedly ponders the state of her marriage, almost ignoring the gun being waved around. ‘Drifting’ sees a vagrant, a man who has spent time in mental institutions, wander the freezing streets before being taken to the police station. Yet despite the aggressive nature of the detectives who interrogate him, the whole affair passes as if in a dream, leaving the characters (and the reader) untouched. They knew where their conversation was going. It was sure to keep getting sidetracked, with no point to it whatsoever. That was the reason, too, why it was satisfying to talk to her. Their conversations never had a point, and so they never reached any point. I said that to the invisible chicken next to me, which agreed. Now if ever there was a line I wish I had written, that’s pretty much it. One of the themes that does occasionally appear is the melancholy of existence, and several of the stories show people wandering around in settings enhancing a mood of loss. ‘At the Amusement Park’ has a man slipping into an abandoned complex, sitting in old attractions and remembering his younger days, while the protagonist of ‘Losing the Olfactory Sense’ wanders the streets of a town doomed to be flooded by a newly constructed dam, a place of silence and dust. This theme also pervades an interesting trilogy of stories in the middle of the collection, ‘Animal Songs of Boredom and Fury’, in which a man who has turned his back on civilisation spends his time by the river, in a cave by the sea and at the top of an abandoned lighthouse. Again, there is no real direction to the stories – in fact, we’re not even completely sure that the nameless central character is the same one in each part. These are stories without location, timeless, a literary laboratory outside the normal world to experiment with… something. …and what we enjoyed was the feeling of certain words in the rambling conversation being repeated and reiterated so that a certain rhythm was felt, and the feeling of listlessness created by that feeling. In this way, our conversations were ones that not so much broke free from reality as deviated from reality, and our reality lay in a place that deviated from reality, but that reality was more real to us than any other reality, and we knew that what made reality insignificant was none other than insignificant realism. Don’t be too hard on the speaker here – he is talking about (and to) a corpse. In a book like this, then, the translation is crucial, and on the whole this was a good effort. As you may have noticed, I didn’t credit the translator above, and that was deliberate, because there were actually too many of them to name at that point. Two of the stories were joint efforts between the writer and two well-known names in K-Lit (Sora Kim-Russell for one, Krys Lee for the other) while the majority of the stories were divided between Jung Yewon and the team of Louis Vinciguerra and Inrae You Vinciguerra. One interesting thing I found (and I’m not sure others would agree with me), is that the stories translated by the Vinciguerras appeared slightly less abstract and more plot-centred whereas Jung’s efforts were often more about the effect of the words. This may just be due to the choice of stories, but I certainly felt a slight difference in style in the last five stories. If anyone would like to weigh in on that, I’d be most grateful. A Most Ambiguous Sunday has been described as a typical Dalkey Archive book, and I’m not going to dispute that. Jung Young Moon, on the basis of this collection, will not be to everyone’s liking, but if you enjoy hypnotic, repetitive sentences musing on the emptiness of life (Beckett is a reference point I’ve seen mentioned several times), this might be a book for you. I won’t pretend that I understand everything the writer wanted to say, but I did enjoy it immensely. It’s a book to take your time over, one to read on a lazy, sunny day. Great review, and have finally got around to the novel myself almost exactly one year later. I can see what you mean about the distinct differences between the stories translated by the Vinciguerras vs. those by Jung. It did feel more about the choice of stories than the translation – the differences were so distinctive I don’t think it can have been just the latter – but I say that without having checked out the Korean originals. Interestingly in the Korean original the collection was named after another story in the book – 목신의 어떤 오후 – translated as Afternoon of a Faun (from the Debussy piece). Although the English title selected – based on the final story in the collection (더없이 어렴풋한 일요일) does seem to better capture the nature of the book. Yes – it’s on my “to buy” list from Amazon, although I’m still working my way through the Dalkey series. The Son of Man by 이문열 is my favourite so far. Does seem a little poor given how much you have done to promote the series.